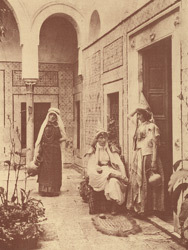 "'An Arab Household' (E. R. Ashton - Bronze Medal). A captial study of Oriental life, of more than ordinary pictorial quality and of very fine technique. Mr. Ashton was, we are glad to say, also successful in securing a silver medal in our Holiday Tour Competition, and we congratulate him upon his double success. He has a penchant for rough-surfaced papers, and has successfully overcome the difficulties which many workers experience in getting good tones, for all his prints are of a pleasing, warm, sepia colour, which has been not badly reproduced in our collotype illustration."